Why doesn’t my pellet cooker start (ignite) after I push the START button? WARNING: If your pellet cooker fails to start, you MUST remove the grates and heat diffuser/HMS and remove any accumulated pellets BEFORE you attempt to start it again. Failure to do so could result in an uncontrollable fire in the body of the cooker, which has the potential to cause physical damage to the cooker. 1. The burn grate has accumulated ash from previous usages, which is covering the igniter assembly and preventing it from coming in contact with combustible material (pellets). a. To prevent this type of failure, prior to use, vacuum all of the ash from the burn grate, firepot and the body of the cooker. 2. The burn grate does not fit correctly in the firepot, preventing the igniter assembly from coming in contact with combustible material (pellets). a. Prior to each use, the burn grate fitment into the firepot must be checked to make sure that it functions correctly. The high heat generated from burning pellets in the burn grate, can cause the burn grate to change shape, which may cause the misalignment of the igniter assembly to the burn grate. Follow the procedures outlined in the manual to correct the fitment of the burn grate into the firepot. 3. With the burn grate properly fitted into the firepot, the igniter assembly is not aligned properly within the hole in the burn grate. a. To properly align the igniter assembly to the burn grate, you may gently pull up or push down on the end of the assembly, to correctly align it to the hole in the burn grate. 4. The pellets being used may have been damaged by moisture or have a higher than normal moisture content, or may be of poor quality. 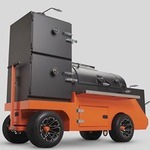 a.	Yoder Smokers preferred brand of pellet is BBQr’s Delight. In our testing, we have found them to be of the highest quality, and are the most consistent in performance and reliability from bag to bag. Remove all pellets from the cooker and try a different brand of pellets. 5. The igniter element is damaged or bad. There are two ways to test this. a. If you have an ohm meter, you may test the igniter element for the proper reading. To do this, remove the burn grate and reach behind the igniter assembly and gently pull the igniter element wires out till you see the connector. Unplug the connector, and using the connector end that is attached to the igniter assembly, use an ohm meter to take a reading from the 2 contacts in the connector. If the element shows no reading (continuity) on the ohm meter, it is bad. It the reading is above 140 ohms, the igniter element is good. b. If you do not have an ohm meter, you can do a visual test to see if the igniter is working. Remove the burn grate so you can see the entire igniter assembly. Clean all ash and debris from the igniter assembly. Get a small bowl or pan to catch pellets with. Plug the power cord into the cooker, and flip the power switch to the “on” position. (DO NOT TOUCH THE IGNITER DURING THIS TEST) While holding the bowl or pan under the auger opening to catch all the pellets, hit the start button. Pellets will start accumulating in the bowl or pan. After about a minute the igniter should start getting hot (DO NOT TOUCH THE IGNITER DURING THIS TEST) and progressively get hotter and turn red. As soon as you have visually verified that the igniter is getting hot and working, flip the power switch to the OFF position. The pellets should stop dropping and you may unplug the power cord. Although I always unplug the power cord from the wall socket after each cook, I leave it plugged into the rear of my YS640 while unused. The thing is that I can not then start the smoker without unplugging the power cord from the rear of the smoker, counting to 10 (or whatever) and replacing the cord. Once doing that, I'm good to go but it is a bit of a pain in that I have to move the smoker to get behind it, do this little unplug-plug dance and return the smoker to its proper position (not as easy as it sounds on brick pavers). Have you ever heard of this before? What could it be? This is a new one for me, as we have never had anyone tell us this before. If you unplug the power cord from the electrical outlet, it is fine to leave the cord plugged into the cooker. We have had customers that do this, and eventually, because of cord movement, will need to reseat the cord into the cooker socket.